“Why do so many people struggle to learn the guitar? “Why do so many people get stuck on a plateau, not getting better for years and decades”? I was asking these questions because I was living with them. When I started teaching guitar, I was stunned that most students found it so difficult to do what I found easy to do when I started. As the years went by, I met so many guitar students that had quit trying to learn guitar, only to try again with a new teacher or method book, only to fail again and repeat the process. And of course, the most common experience was meeting so many people who could play, up to a certain level, and then they got stuck on a plateau, couldn’t get any better, and just stayed there year after year. It took me 25 years of teaching, searching, studying, and experimenting to come up with the answers to these questions. But I did find the answers to all these questions. I found what was missing in all guitar instruction. I invented a new language to give this missing knowledge to guitar students, beginners and long time players, and I put it into a book: “The Principles Of Correct Practice For Guitar”. The Internet was just taking off, and “The Principles” took of with it. Within months of promoting “The Principles”, people were flying from all parts of the world to my home in Woodstock, NY, to take private lessons with me. Since that time, thousands of people have used “The Principles” to make progress on guitar they never thought possible, and we have more testimonials telling us that than we could ever put in one place! 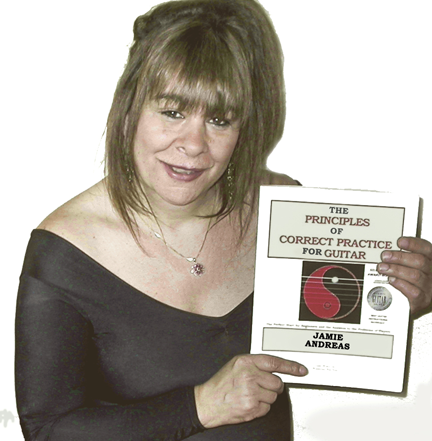 ""The Principles" has made the guitar playing dreams of thousands of players come true! How Do "The Principles" Work?..